The Bluetooth USB adapter supports 7 devices connected simultaneously, Bluetooth mouse, Bluetooth headsets, and Bluetooth keyboard can all communicate clearly with the USB wireless adapter and potentially open up a whole new realm of possibilities for how customers enjoy their computers. The Bluetooth USB adapter is fully qualified Bluetooth 4.0 system and it smoothly supports backward compatible Bluetooth V3.0/2.1/2.0/1.1 and Bluetooth Low energy. 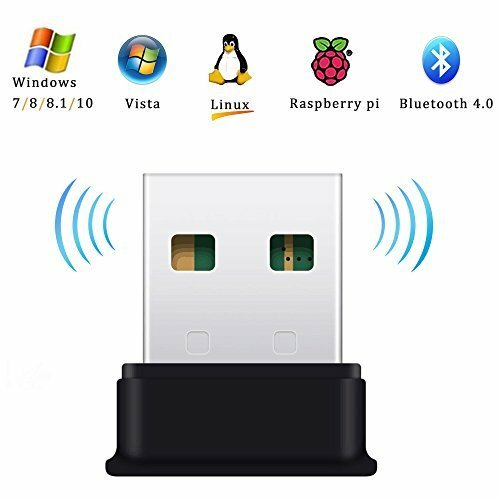 The Bluetooth USB adapter is compatible with Windows 10 / 8.1 / 8 / 7 / XP, Vista, Raspberry Pi, and Linux. The Bluetooth USB adapter also supports Bluetooth speakers and headphone, Bluetooth Mic, Bluetooth keyboards / Mouse, Mobiles, PC Plate, and more. *Can work with Bluetooth printer and stereo headphone. *Support Bluetooth speakers, headphones, headsets, keyboards, mice and more. Extremely compact USB adapter. Safe to leave in for laptop travel. Energy efficient. 【ENABLE BLUETOOTH COMPATIBILITY】- HIGHEVER Bluetooth dongle brings the power of Bluetooth to Windows 10 / 8 / 7 / Vista / XP / 2000, Linux laptop / desktop computer and Raspberry PI. It is NOT compatible with Mac OS, TVs or Car stereo systems. 【TRANSMISION RATE】- With a data transfer rate of maximum 3 Mbps, this USB Bluetooth adapter is able to meet the needs of many people with Bluetooth-enabled devices, the Bluetooth adapter features a nice operating range of 33 feet as long as there are no obstructions between the computer and the connected device. It's important to make sure that you connect it to a USB 2.0 port because USB 3.0 might cause radio interference. 【MULTIPLE USAGE】- HIGHEVER USB Bluetooth dongle allows for connections to multiple wireless devices such as Bluetooth headphones, speakers, keyboards, mice, printers and others. The USB Bluetooth adapter works perfectly for wireless stereo music streaming, and also for Skype Calls, Google Hangouts and mobile phone/ tablet data transfer. 【WHAT'S INCLUDED】 1* HIGHEVER Bluetooth 4.0 USB adapter, 1* CD-ROM. 24-month product warranty and friendly customer service. If you have any questions about this product by HIGHEVER, contact us by completing and submitting the form below. If you are looking for a specif part number, please include it with your message.